This is a DIY project to create a flashing christmas card based on a 555 timer. 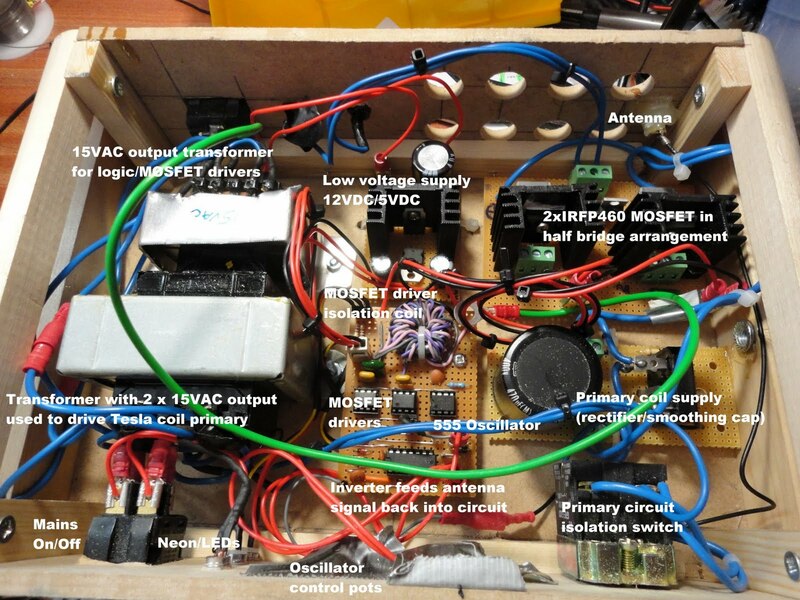 I did a project like this many moons ago at school, and when my local hackspace, Build Brighton, were thinking of seasonal electronics projects we could offer in workshops I decided to try to recreate this idea. The circuit is a basic "astable" circuit (which simply means it oscillates between states). In this case we use the venerable 555 timer integrated circuit to make a square wave oscillator with a frequency of a second or two. The output of the oscillator circuit goes to 0V, stays there a while, then flips up to 9V, stays there a while then flips back to 0V and repeats again. When the output is 9V it lights up a set of LEDs. The "clever" bit is that when the output is 0V a second set of LEDs light up, because those LEDs are already connected to 9V (i.e. "positive") on their other side, and get connected to 0V (i.e. "negative") when the output of the oscillator goes down to 0V. The end result is that the two sets of LEDs flash alternately. 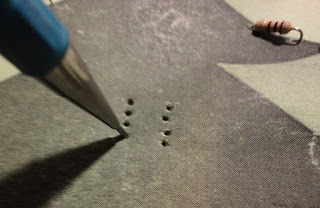 You can build this by poking the component legs through holes punched in the card, then soldering them on the back. This is kind of fiddly but it wouldn't be quite the same end result to build it on a board. When putting the 555 IC on the card make sure that you insert it through the front of the card with pin 1 at the top (the end of the chip with pin 1 will be marked with a notch or dimple). The LEDs must be inserted the right way round for this project to work. The anode (+) side of the LED is marked by a longer leg and the cathode (-) has a flattened edge to the lens. Use the + symbols next to the LEDs in the diagram above to make sure you put them in the right way round and remember the diagram shows the BACK of the circuit! The resistors and capacitors have no specific polarity and can be soldered either way round. Don't heat components for too long when soldering. LEDs are particularly sensitive to overheating and it probably won't do the 555 a lot of good either. It helps to bend leads together (so they stay joined by themselves) before soldering so you can be quick with the heat. My card was particularly utilitarian, but I'm sure you can make it look much nicer :) sticking a sheet of card over the wiring hides the mess and strengthens it all. It would be good to see other peoples results! I'm currently trying to help out a local artist who is building an Interactive Ping-Pong Table, where each bounce of the ball generates a musical sound which depends on the position of the bounce. I found pretty quickly that some kind of amplification is needed.. the piezo disks are pretty sensitive to a sounds close by but not so great for something the other end of a table. First of all I tried to boost the level using 4069 inverter chips (I got that idea from Nicholas Collins' book - Handmade electronic music) since I've never really understood op amps and didn't want to get into all that dual supply rubbish. In my initial circuit I used an NPN Darlington transistor on the output of the amplifier stage to generate the logic pulse. It kind of worked, but I was finding that the MCU would hang when an interrupt-on-change interrupt was being fired by multiple sensors. I also had a problem with the output getting stuck on (I think this might have been due to supply noise, noise picked up on a long wire to the piezo, and an overly sensitive amp stage). I think the hang thing might have been due to noisy outputs triggering a rapid train of interrupts than the poor PIC could not handle. I have an IKA Logic analyser and using this I could see a mad train of pulses coming from sound waveform, echoes, supply noise whatever... I don't really know, but the PIC didn't like it. 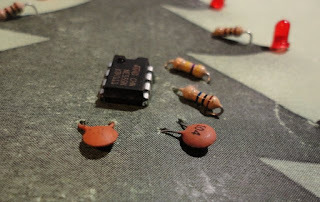 Searching about for ideas online I read about running op-amps like LM358 from a single supply, which seemed to be a better way to do things than using logic chips as amps. I also saw how a 555 monostable circuit can be used to clean up a dirty pulse by keeping an output high for a timed period as soon as the first edge of the input pulse comes in, so the train of pulses from reverberations and so on get masked by a nice clean extended output pulse... nice and friendly for MCU interrupt pins. The resulting circuit seems to work pretty well, even though it still seems a bit complicated. Maybe it is a case of over-engineering, but I learned a lot and it does at least work pretty well. Using SMDs I can also get it on a board about the same size as the piezo disk so it can sit on top. However working in 2 dimensions with 3 sensors seems to be a completely different kettle of fish... the technique is called Multilateration and there have been entire research papers written about it :o) The problem is that all the timing readings you're working with are relative... its more complicated than I thought to get back to an actual position. Maybe I can simplify things, since my sensors will be arranged in the corners of a rectangular area and I can always calibrate them at the start by tapping the corners of the table. Or maybe some dirty trial and error approach will be good enough... Anway thats the next step... wish me luck..! // for now ready for us? Got a bit of time this evening to test out the LED array I made yesterday for the Build Brighton message fan.. The thin wire-wrapping wires are soldered to a scrap of veroboard for test connections , and the code is running on a PIC16F688. The shift regs are wired to share common clock lines, but each has its own serial data line, so all LED data can be loaded in 8 clock pulses so refresh should be nice and fast in the final thing. Everything seemed to work first time, amazingly! These water clear RGB LEDs are nice and bright, but its possible to see the individual red/green/blue elements more than you would in a diffused LED (e.g. when you display yellow you can see the red and green elements rather than a single yellow point). I'm hopeful this won't be a problem when the thing is spinning and viewed from a distance. My 100 ohm series resistance is rather low when the LEDs are run continuously but in the past I've found a low-ish resistance like this to be good when pulsing the LEDs quickly in a POV display. Still - I'll have to try to make sure the LEDs dont get left on 100% duty for a long time just in case they don't like the current. Next step is to build a microcontroller board small enough to fit into the hub of the fan, then we (me and the Rev's Neil and Dave from BuildBrighton) need to get it power (via a pair of coils) and data (hopefully a modulated signal riding on the power)... and so the fun will really start! I expected the sheets to be horrible to work with, and a nightmare for lifted traces, but actually it all went pretty well. I designed the layout for 8LEDs in EAGLE and then edited the image to double up the number of LEDS (my free version of EAGLE doesn't allow a layout big enough). I used press-n-peel blue toner-transfer film in my old HP LaserJet 1000 printer and ironed the toner onto the copper-clad film (just as I do for rigid PCBs) and etched in ferric chloride. Some gentle cleaning with fine steel wool and the result was pretty good. I've had a bit of practice with hand-soldering SMDs.. I use a 0.4mm needle tip and a high temp (400 celsius) with 0.015" silver bearing solder. 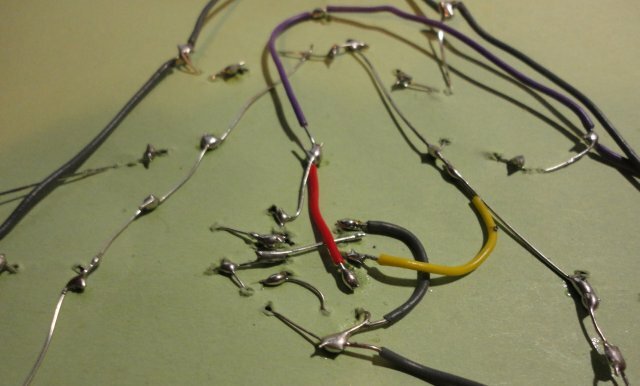 The high temp helps zap the solder without heating the part for too long, as long as you're quick. I do all the work through a 10x loupe and make a lot of use of tweezers and a flux pen, and to be honest I actually quite enjoy it! I had a handy roll of kapton tape which I used to insulate the ground track so it didn't short on the LED anodes passing right above it. Since the tape is heat resistant it behaved itself while the LEDs were soldered. This solved an otherwise tricky routing problem. I was lucky enough to get involved in the Farnell/element14 'road test' programme, where individual electronic hobbyists get a chance to review (and keep) cool hardware items from Farnell. Last year I was lucky enough to attend a really useful free Eagle (PCB Design Tool) course run by element14, and earlier this year my local hackspace, BuildBrighton, reached the final of the Great Global Hackspace Challenge which was sponsored (very generously) by element14. While other suppliers might give out samples and freebies to industry, its refreshing that Farnell/element14 really do seem to be actively targetting and supporting the electronics hobbyist/hacker community - and so I am more than happy to sing their praises here. Anyway, back to my road testing... I chose to review the VNCLO-START1 kit from FTDI. This kit is made up of a USB development board and a separate programmer/debugger board and the current cost on Farnell's web site is a little under £28. The development board is branded the Vinco/Vinclo/Vinculo/Vnclo (it seems that FTDI aren't sure about the name yet, but I will call it “Vinculo”) containing the 64-pin version of FTDI's VNC2 'Vinculum' USB Host/Slave chip. Very interestingly, FTDI have given the board the same form factor as an Arduino Uno, including pin-compatible Arduino shield header sockets and even an on-board ADC chip to provide the six analog inputs. This means that you should be able to make use of existing Arduino shields (add on boards) with the Vinculo, which is a clever move by FTDI. 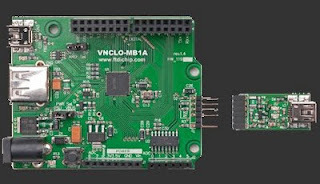 The Vinculo can emulate an Arduino because it's on-board VNC2 chip is so much more than just a USB controller... its a fully fledged MCU. In fact it's a very powerful one, with a 16-bit core, 256kB of Flash, 16kB of RAM and 48Mhz clock among some other nice features... This makes it substantially more powerful that the AVR chip on the Arduino....And that’s before we get on to its USB support: Two full speed USB ports, each individually configurable as host or slave! So, we're talking an impressive piece of silicon (and a reasonably priced one, with the 64-pin VNC2 chips selling on Farnell's site for just over £3, which is cheaper than the Atmega328). The first to USB-host a Novation Launchpad keypad controller and run a suite of animation/MIDI-input apps. The idea is to make a standalone version of my 'playpad' MIDI controller projects. The second is as the 'brain' of my laser projector, where I need a high speed USB device to push coordinate data from a PC to a pair of DACs driving laser-projector galvos. Using a VNC2 means I can use a single chip (no need for separate USB chip and MCU) while avoiding the slowness of a polled USB stack implemented in software. The Vinculo board seems like the perfect way to prototype these projects... so how to get started? First of all I was unable to use the IDE on my desktop computer (where I do all my coding) because of a strange display problem with the source code editor window - all the text becomes garbled and unreadable each time the window scrolls. I reported this to FTDI support who quickly got back with a 'That’s strange, we'll look into it' kind of response but no fix as yet. However, luckily my laptop doesn't get the same issue so I could move on. The second issue I found was stability of the IDE, particularly during debug sessions but even some times when compiling, the IDE would stop responding and needs to be killed in task manager and restarted. Moving on, I played a bit with some of the provided sample code. The Vinculo is not FTDI's first VNC2 evaluation board, and some of the sample code is for the older eval board, which has different pin to connector mappings, meaning that the older sample programs don't work on the Vinculo without modifications. For example the UART (used by the sample programs for debug output) has moved. Luckily the remapping can be done in software.... a very nice feature of the VNC2 is that all the IO's go through a programmable multiplexer, so IO functions can be assigned to pins of your choosing. However the need to reassign IO's just to get the sample programs to work isn't what you want when you're first starting with a new device. Another niggle is that while there are sample programs provided to demonstrate standard Arduino stuff (blinking LED, PWM examples and so on) what is glaringly lacking are any USB code examples that will work, without modification, on the Vinculo. 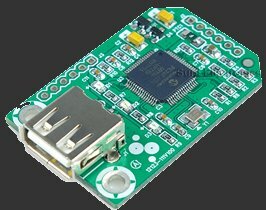 Since USB is the attraction of Vinculo over vanilla Arduino I think this is something FTDI need to work on to make the board attractive to Arduino fans... I am still trying to work out how to modify the USB examples to get them running on Vinculo, and its not been straightforward. On a more positive note, something FTDI have done is to create a simple application framework that should appeal to Arduino coders by presenting an Arduino-like syntax.... For example, when using the supplied main.c in your Vinculo project you define the Arduino standard entry points 'setup' and 'loop'. Arduino-likey function wrappers like digitalOut() are provided, and libraries like Serial are emulated with structures containing function pointers, so familiar Arduino syntax like Serial.begin(9600); can be used.... Its just syntactic sugar, since behind the scenes the VNC2 API functions are being called, and its not 100% compatible (don't expect your Arduino code to 'just work' on Vinculo). However, it's a nice idea and will certainly appeal to Arduino developers. And you are still free to simply ignore it and work directly with the VNC2 API if you prefer. FTDI also have a variety of documentation for online download, which I am still working my way through. I have to say the information seem to be a bit 'scattered' over many different application notes, but at least it mostly seems to be there. Its just a bit daunting and confusing when you first get started. In conclusion, I have to say I'm very excited by this hardware. 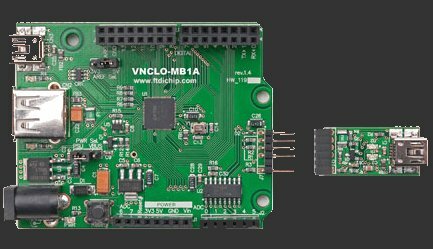 The VNC2 is a powerful and flexible chip, and the Vinculo is a great prototyping board, encompassing some innovative ideas by FTDI. However, at the moment I think much could be improved in the accompanying development software package. For me it has been a uphill struggle, and I think that Arduino users who are not experienced coders may fall at the first hurdle with this.. that is until FTDI can iron out the IDE issues and provide a more consistent and usable set of Vinculo code samples. This is a new product though, so I have hopes that these things will improve soon with software patches. The ability to direct debug text output over the same USB cable that runs the debugger, where is can perhaps show up as a virtual COM port on the host PC (like on the mbed). I will post again soon with my progress applying the Vinculo/VNC2 to my own projects... watch this space! Last monday, BuildBrighton (my local hackspace) along with Playgroup (Brighton arts and events collective), ran “Noise Toys”... a day of making noisy gadgets in a local pub, anyone welcome – as part of the Brighton festival fringe. 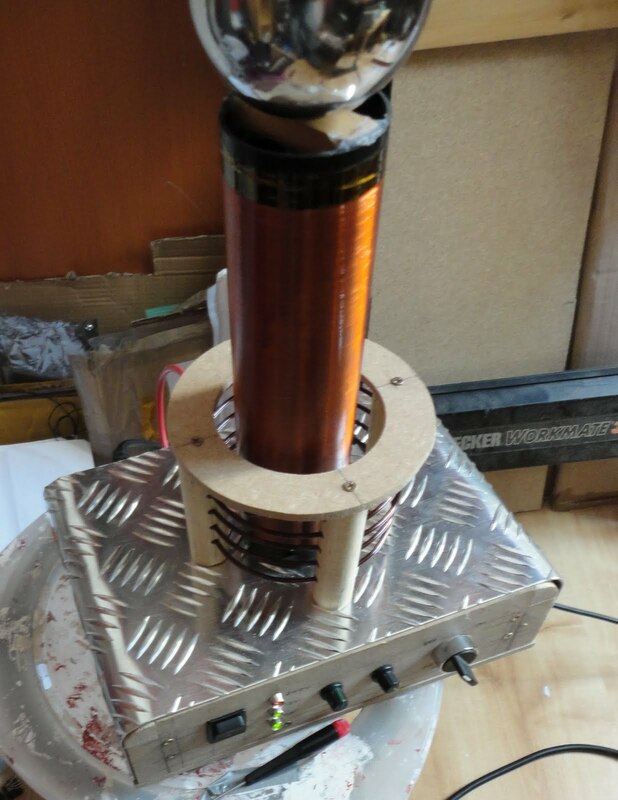 My idea was to have some MIDI triggered solenoid percussion (similar to http://hotchk155.blogspot.com/2010/10/solenoid-drum-machine.html) together with some kind of control surface to allow passing punters to control the solenoids and make little tunes and rhythms. I thought it would be fun to use my Novation Launchpad to control the solenoids. The Launchpad is a USB device (it doesn't have 5-pin MIDI connectors) so something would be needed to work as a “USB host” to allow a program running on a microcontroller (Arduino, PIC etc) to listen out for button presses and to control the Launchpad lights while sending out MIDI notes to trigger the solenoids. I'd thought about making my Launchpad into a standalone MIDI controller before, and I had been looking at the FTDI VNC2 USB host chip (more about that later) but first of all I decided to try out the Sure Electronics USB HID Host Module which is based around a PIC and is a little short of £10 on eBay including the postage. Sure's board is a nice little module, with 0.1” headers for the PICKit programmer and for serial comms with other application hardware. It also has a USB Type-A (host) socket and couple of addressable LED's. The on-board PIC24FJ256GB110 supports “USB On the go” (OTG) which means it can act as a USB host. Sure's web-site has downloadable source code for a firmware app, based Microchip's own open-source USB host stack, that will host a standard USB mouse or keyboard. The only disappointment here is that only a minimal set of I/Os from the PIC are bought out through the headers which limits applications of the board since most of the PICs I/Os are inaccessible. Still, its a nice handy board and reasonably priced. But will it work with the Launchpad? The Launchpad is not a standard USB MIDI or HID device. Rather it has a custom interface using two interrupt endpoints. This can be accommodated on the PIC with a couple of mods to the “Generic” device driver code from Microchips stack. It was my first time working with USB hosting and with 16-bit PICs so it was a learning experience. When used under Windows via the Novation drivers, the Launchpad shows up as a MIDI device and is controlled by sending it MIDI note and controller info to toggle the LEDs. When Launchpad's buttons are pressed, it spits out MIDI notes/controllers which an application can act on. So that the MIDI interface from Windows but exactly is happening on the USB wire? Well, a quick bit of trace code on the PIC showed that exactly the same MIDI bytes are being passed between the USB endpoints, making it nice and easy to drive the Launchpad from an embedded USB host like the PIC. Thankyou, Novation! The main gotcha for me was that USB I/O operations need to be first initiated then polled for completion (or they can send completion events). However, to keep the stack ticking, the app must poll it via a “USBTasks” function. Without this polling, the stack does nothing and I/O will not complete. Ok, so just call USBTasks all over the place right? No sireeee, not if you don't want to end up in a confusing re-entrant mess and watch the PIC collapse in a heap. In fact you need to be careful not to make USBTasks call anywhere but the top level loop, and to make sure that the application attempts just one USB I/O operation between USBTasks calls. One result of this is that long sequences of USB I/Os can become painfully slow to complete. With the Rainstorm sequencer I found that it became very sluggish at responding to input when there were more than a couple of dozen notes in play. I am looking forward to trying this on the FTDI VNC2 chip which has the USB stack and application running in separate threads and should be able to get much better throughput. OK – back to the fun and games! So the UART from the PIC is broken out to the header on the Sure Electronics board, and with the code changed to set up the correct MIDI baud rate and remove all other UART debug output from the code I could just stick on a 5-pin DIN socket via a couple of 220R resistors and I was sending MIDI. Once all the electronics was working it was time for the art... and unfortunately I didn't leave myself much time for that bit. I ended up gathering up milk bottles and hammering together a wooden frame for them to sit on, all the night before the gig. I had for some reason assumed that milk bottles, tuned with water, would make a pleasing “xylophone” effect... I hadn't really anticipated the the terrifying wall of machine gun clinking that they actually threw out. Many years back I got my Spectrum to run on an old greenscreen mono monitor I was given. I don't have that speccy any more but decided to try the same trick on a spec I picked up on eBay earlier this year. With a composite output it is possible to hook it up to most modern TVs and many computer monitors. Well, technically there is nothing to it... the Spectrum already has the composite signal (it is fed into the UHF modulator box that converts it to a TV signal) so its just a matter of getting the signal to the outside world. I already had a 3.5mm mono jack to coaxial video lead from an Olympus digital camera (its the lead for showing your pics on the TV set) so I decided to simply add a 3.5mm socket so I could use the same lead. Connect the SIGNAL (jack plug tip) to the connection going into the box furthest back from the TV socket (on my speccy it had a white plastic insulator). Connect GROUND (jack plug barrel) to the metal box itself, using solder to make sure you get a good connection. Fit the socket... ah hot glue, how thee makes a craftsman of any pleb! And the proof of the pudding... a "Specbook"